In just a little over two weeks, thousands of gamers are going to converge upon a large hotel right outside Washington. Armed with shirts bearing nerdy references, portable consoles and many musical instruments, they will spend four straight days jamming out, partying, going to panels full of cool information about topics they love, and meeting other gamers. By the time the weekend is over, new music will be discovered, faces will be rocked off, and best of all, new friends will be made. This beautiful phenomenon is called MAGFest, and it's probably the best gamer convention that you haven't heard of. Yet. Founded in 2002 by a group of gamers with a passion for the music and culture surrounding games, MAGFest's credo is "For Fans, By Fans." Celebrating their 10th convention January 5-8, the festival has been entirely self-run with no outside sponsorship whatsoever, a fact the key players of MAGFest are proud of. Whereas a gaming convention like Penny Arcade Expo draws huge numbers thanks to its popular webcomic's origin, MAGFest's appeal has been built from scratch by the people who believed in its idea from day one. Like other conventions, MAGFest hosts panels on a variety of topics, most related to gaming or game music. However, one of the biggest features of MAGFest is its concerts. Since its inception, the event has showcased indie bands with a focus on music that celebrates gaming culture. Artists such as Armcannon, who reinterpret beloved classic game themes with their own flair, The OneUps, who bring elements of jazz into their original compositions, and The Megas, who write music strictly about the universe of the Mega Man game series, have been MAGFest regulars in the past. The next MAGFest takes it up a notch by featuring one of the biggest names in game music in its roster: Nobou Uematsu, who is best known for his work as the composer of the Final Fantasy series. The talented guest will play at MAGFest with his new band this year, Earthbound Papas, and will play their versions of songs from popular role playing games such as "Blue Dragon," "Final Fantasy VII," "Final Fantasy VIII" and more. In addition to the regular stage, MAGFest adds a second stage this year strictly to house chiptune artists. Chiptunes are a form of game music created using vintage video game consoles and computers. Nine artists will take the second stage this year, offering a completely different style of music for gamers so inclined to dance their hearts out to the sounds of their youth. 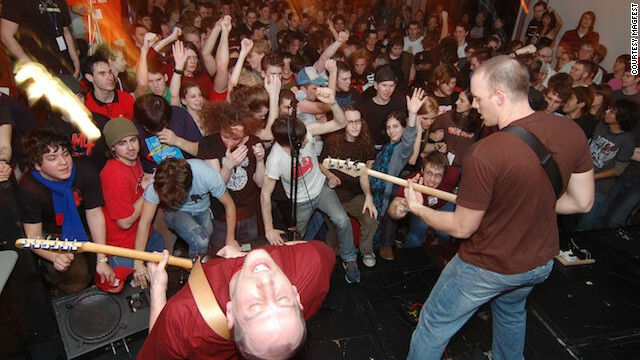 When attendees have had enough of the concerts, they can wander into the Jamspace, which is always open at any time for attendees to show up, meet other musicians, and play to their heart's content. Outside of concerts, there's still a ton to do, such as a 24-hour gaming room (open the full four days of the fest), tournaments, a LAN space for PC gamers who wish to compete or play cooperatively, dozens of vintage arcade machines in fully functional order available to play for free, a merchandise room where one can find everything from rare vintage games in the box to homemade arts and crafts, and more. So yeah, there's a lot to do. But what is it that makes an event like MAGFest stand apart from any other small con that happens in the United States? Perhaps it's the company the event keeps. Steph 'Quarky' Butrej, MAGFest's web content guru, said MAGFest evolved in unique ways thanks to the attendees. "The event was just Friday through Sunday in the earlier years, but then people started to show up on Thursday to help us set up. They weren't volunteers, but attendees who had purchased tickets and were just ready for the fun to start. And they kept showing up, so we thought, why not start the event one day earlier and accommodate the people that are ready to start early?" In their ninth year, MAGFest was host to 3,000 attendees - and it was unable to accommodate any more in the event's hotel. A new venue for their 10th year allows MAGFest to prepare for an even larger event. And with guests as prominent as Uematsu on the roster, a growth spurt seems like an inevitability. And yet, despite this con's expansion, what keeps fans of the event coming back is intimacy. The ability to see the same people and play music with them, even if you had never met them before, is a key part of what makes the event tick. "I've been at MAGFest since the fifth year," says Kunal Majmudar, a guest member of the OneUps and an independent game music composer. "For me, MAGFest is a place where I can really let loose and embrace my inner geek. The whole weekend is packed full of jamming with my musician buddies and hanging out with thousands of gamers who adore video game music. "I'm seeing more and more of my colleagues in the industry attend each year, and it's ridiculously fun having these guys all in one place at one time. There something electrifying in the atmosphere. It's the biggest collection of video game music-loving nerds I've ever seen. And there's something just so right about that." Way to go, "Mr. Magfest!" He was an old college friend who used to host our anime/sci-fi club dance. I still remember when he squeaked together the first event. At the time, if you'd told me when my unborn daughter turned four, I'd be reading an article about MagFest about CNN, I would have called B.S. I have to applaud his tenacity! This is such a great description of Magfest. Good job! The Power of Emotional Targeting in Event Marketing Do you make decisions based on logic or eoomitns? When marketing an event, have you ever tried tapping into your event registrants’ emotional chords instead of their logical reasoning? Logic makes people think. Emotions make people act. According to Hugh Macleod, your event attendees may be more interested in why you are organizing an event, not what you are actually doing. And if your ‘why’ aligns with their own ‘why’, they may be more inclined to register and attend. Discover a new type of event marketing which builds on value and emotional connections! Check out the full article.